This image of the galaxy cluster Abell 2744 was obtained with NASA's Hubble Space Telescope. 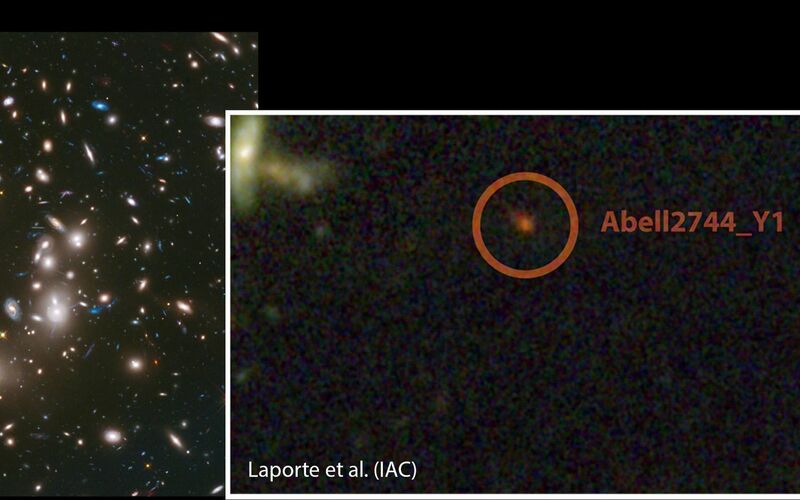 The zoomed image shows the region around the galaxy Abell2744_Y1, one of the most distant galaxy candidates known, harkening back to a time when the universe was 650 million years old. NASA's Spitzer Space Telescope helped to narrow in on the galaxy's great distance. 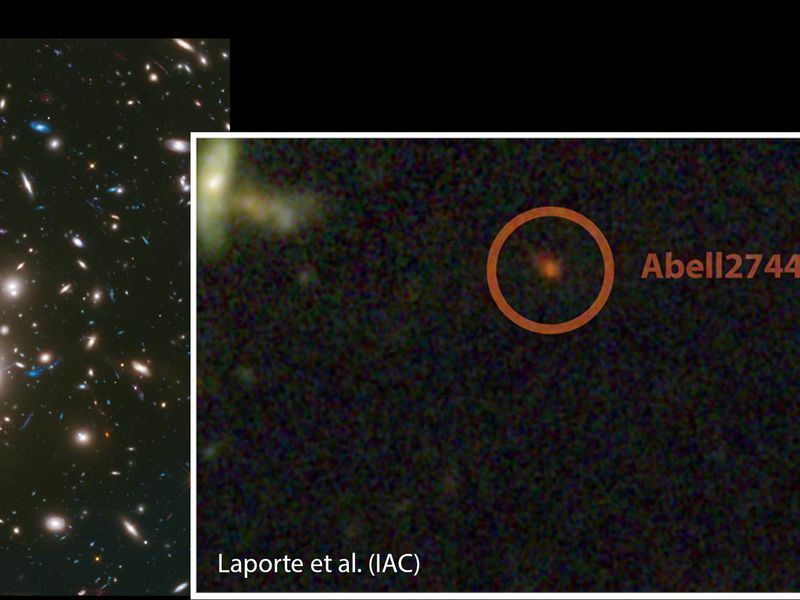 The galaxy was found with the help of a gravitational lens: gravity from the mass in Abell 2744 acts to magnify the light of more distant galaxies behind it. These observations were part of NASA's Frontier Fields program, designed to push the limits of how far we can see into the early universe. 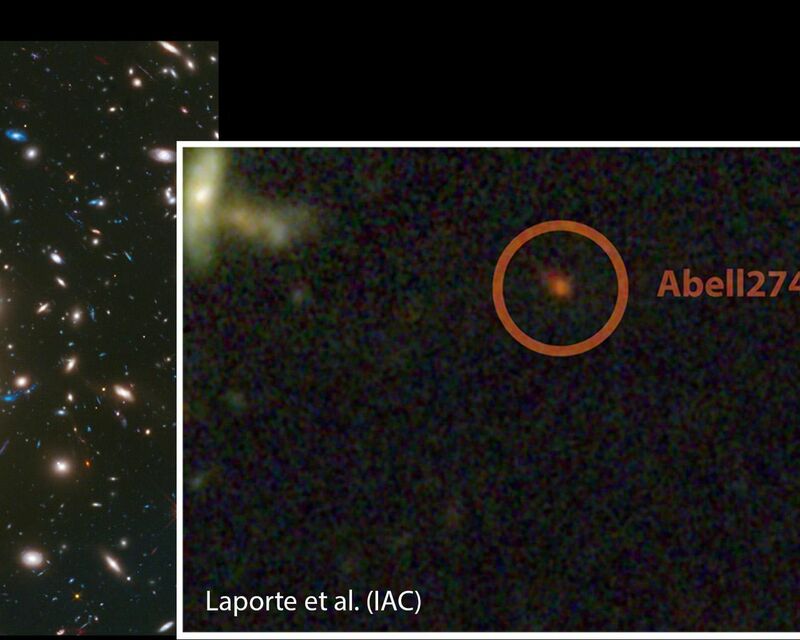 See PIA17569 for a full view of the galaxy cluster Abell 2744. NASA's Jet Propulsion Laboratory, Pasadena, Calif., manages the Spitzer Space Telescope mission for NASA's Science Mission Directorate, Washington. Science operations are conducted at the Spitzer Science Center at the California Institute of Technology in Pasadena. Spacecraft operations are based at Lockheed Martin Space Systems Company, Littleton, Colorado. Data are archived at the Infrared Science Archive housed at the Infrared Processing and Analysis Center at Caltech. Caltech manages JPL for NASA. For more information about Spitzer, visit http://spitzer.caltech.edu and http://www.nasa.gov/spitzer. The Hubble Space Telescope is a project of international cooperation between NASA and the European Space Agency. NASA's Goddard Space Flight Center manages the telescope. The Space Telescope Science Institute (STScI) conducts Hubble science operations. STScI is operated for NASA by the Association of Universities for Research in Astronomy, Inc., in Washington, D.C. For more information, visit: http://hubblesite.org and http://www.nasa.gov/hubble.